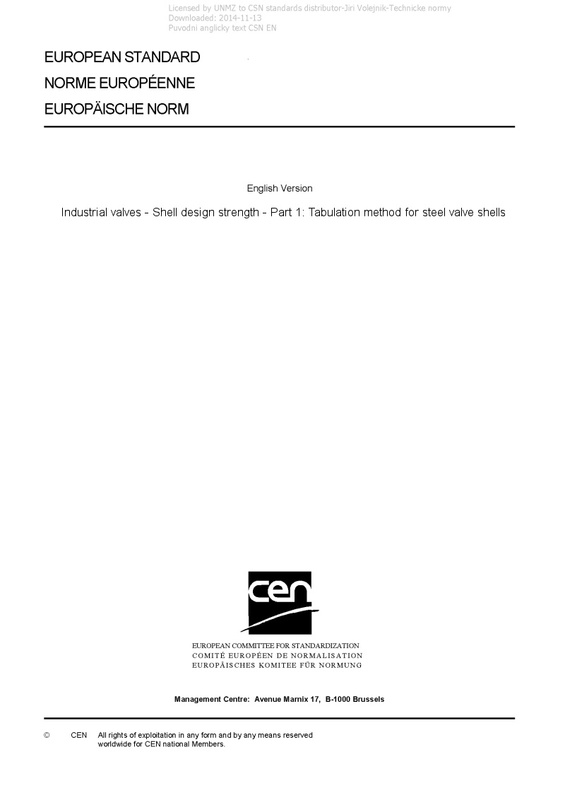 EN 12516-1+A1 Industrial valves - Shell design strength - Part 1: Tabulation method for steel valve shells - This European Standard specifies the tabulation method for determining the wall thickness of valve bodies, bonnets and covers with essentially circular cross-section made in forged, cast or fabricated steel. For valve shells with oval, rectangular or non-circular shapes, see 8.6. The range of PN or Class designations for which thicknesses are tabulated is: PN 2,5, PN 6, PN 10, PN 16, PN 25, PN 40, PN 63, PN 100, PN 160, PN 250, PN 320, PN 400, Class 150, Class 300,Class 600, Class 900, Class 1 500, Class 2 500, Class 4 500. Pressure/temperature ratings are specified for each material group for the above PN Standard Class and Special Class designations. The non-destructive examination procedures and acceptance levels that need to be applied to the valve shell components in order for the valve to be used at Special Class pressure/temperature ratings are defined. Details are also given for the alternative rules for small bore valves of DN 65 and smaller designated as Limited Class. This standard does not apply to threaded end valves: - DN 80 or larger; - or which have pressure ratings greater than Class 2 500; - or which operate at temperatures greater than 540 °C. Socket welding end valves DN 80 or larger are outside the scope of this standard.